I wonder if it is the same user from a couple months ago. It is a new account but I think the last account was destroyed for the same antics. @gunr2171 No not that once. It was funny though. @DavidG I've had many of those days, too. But... \o/ This is my best rep day ever! (by +6) Still haven't maxed out, but there's a bounty due in a few hours. @Mogsdad Feels good when you hit the 200 mark! I think my max was 355 in 1 day. @Mogsdad It will happen by accident one day, one of your posts will hit the hot network questions list and suddenly that answer you thought was average at best will suddenly hit 50 votes. @Mogsdad what are you at so far today? @Mogsdad nice, is that your best including bounties? @TylerH Seems strange, but yes. I've answered a few bounties that the OP just let rot. A bit worried about today's, since I answered it days ago. @TylerH Now that's a bounty. 50 is kinda pedestrian. Wow nice. Best I have had in one day was 260. that was without any bounties. @PaulRoub lol "fix two things" "I fixed one, still broken"
Today of all days, not complaining about rep, though. Today is "What would I even do with site analytics data?" day. Ooh, analytics, talk dirty to me baby. Yeah, I got that a few days ago, looked at the analytics once and not since. I feel like there should be a 50k target to aim for now. I don't think I could handle that, I'd be deleting and banning all over the place. Meanwhile, an answer from July 2014 was just accepted. Maybe Mr. Bounty Man will write back one day. I wouldn't complain if there were a couple more mods running around. I do sometimes think the mods are overworked, especially when I see flags ageing away. Thanks, do you guys never downvote these posts? Or are you out? @SotiriosDelimanolis In addition to closing it? What would be the point? This one's off-topic, but it's well-written and coherent. As a deterrent. Maybe I'm too harsh. @Kyll You realize it's quite possible for a post to be NAA, VLQ, Spam and Offensive, right? So, pick the flag that seems most right to you. A consensus will emerge and the matter will be handled appropriately. True, but you can tell if the flag is approved or declined, and whether the post is deleted or left. Wouldn't a more uniformly applied rule ease the handling process of such posts? Okay, does that mean I can pick a random flag (except custom) each time I flag gibberish? Because if it means that I am going to be very happy. I guess we just wanted to know how best to handle a gibberish post without giving the overworked mods even more stuff to do unless that's the best way to do it. @DavidG doesn't really matter. If it looks spammy, spam-flag it. If it looks rude/abusive/offensive, use that flag. Otherwise use whichever VLQ/NAA you can hit first. @NathanOliver if it's a new user, that's probably abuse. If it's not, their cat probably sat on the keyboard. So that means we should go for spam/offensive to destroy the content with spam accumulation? @Kyll if that's plausible, sure. If it looks like the cat thing, then no - NAA would suffice. if it's a new user, it doesn't matter (and spam is plausible). If it's someone who has reasonable posts elsewhere, then that spam flag will be declined because it'd mess them up for what was probably an innocent mistake. Trivia: at one point, spam/offensive were the only flags in the system, so we used them for everything (also, there was no concept of a declined flag). The other flag types were added mostly for the benefit of the flaggers. I get it now. Thanks a lot for the info! I like the differentiation between new and existing user, though I think these have all been new. @cimmanon, on this post, by saying up front "When using the BEM naming convention", wouldn't that make it less POB? or are those sets of rules still broad enough where the actual decision is left up to the user? @Shog9 if you're still here, can you mark my meta question as a cross-site dupe of the one you answered on MSE? Is there anything about just giving someone working code that is having problems with a homework assignment? @TylerH Okay. I just wasn't sure how this site handles it. I would say you can't argue the latter anymore because we have questions like "what is scope" or "how can I nest elements"
Note to self: never provoke a mod to begin a Meta answer with "Alright, if you want to do this in public..."
@PaulRoub did you see that somewhere? A: What to do with a moderator abusing his privileges? @NathanOliver "(... CSS fucks up)"
In this question, OP tried to define a global but failed. As the syntax is correct, I asked for more data. An answer took a guess and basically told OP to add the files he defines the global in to his package. Answer is accepted, but the question still has no MCVE. What do I do? Edit an imaginary one in? @TylerH Sorry, I don't understand that. Use commands for a list of commands. @TylerH May the Vote be with you! @TylerH Only applies to v2 though. @TylerH That'll be @gunr's decision. 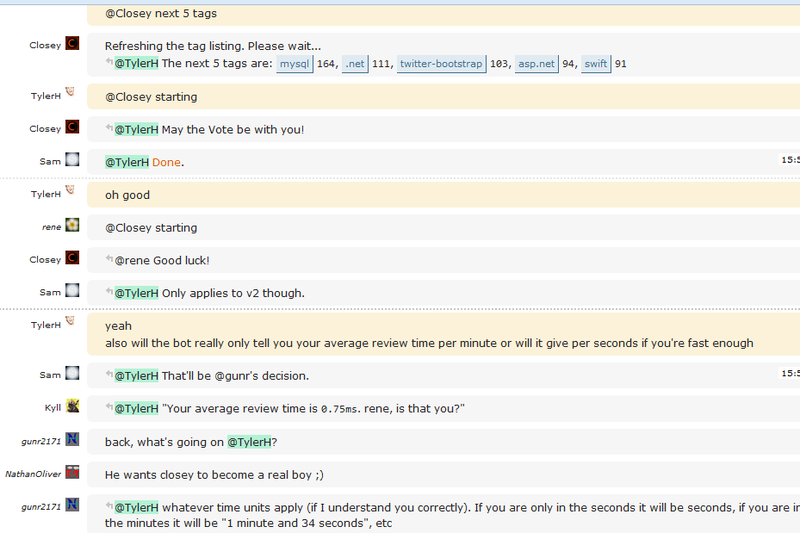 @TylerH "Your average review time is 0.75ms. rene, is that you?" back, what's going on @TylerH? we could make it worse for you? @TylerH You don't like pings? do each of those turn green for you? It would be awesome if we could space them and actually get the pings to play a tune. Did you guys ever see where they made rumble strips on pavement play a song? does sand count as ground? If your toes are in sand what are you doing in a chat room? > Thank you for reviewing 40 close votes today; come back in 1 hour to continue reviewing. @rene Thanks for reviewing! To see more information use the command last session stats. @rene Your last completed review session ended 24 seconds ago and lasted 1 hour, 7 minutes and 26 seconds. You reviewed 40 items, averaging a review every 1 minute and 41 seconds. @TylerH Thanks for reviewing! To see more information use the command last session stats. I'll be back later to run the queues... Cheers! Are we allowed to say "hammered"? There are also t-shirts that say "boom", yet "boom" has been banned from this room as response to cv-pls'es. so it must be before, no? As @gunr2171 mentioned earlier, it seems appropriate to stop reporting a closure with "boom" or even "success", but a simple, unemotional "closed" would be enough.